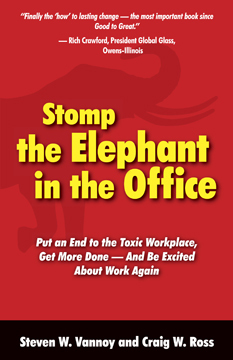 Get a free Stomp the Elephant in the Office eBook Oct 30-31st Offer extended through Nov 1! For five years, Stomp the Elephant in the Office has been transforming leaders worldwide and we treasure the countless success stories we’ve heard from leaders like you. This week, we released Stomp the Elephant in the Office as an electronic book via Amazon.com (you can download a special reader to read it on your PC or Mac if you don’t have a Kindle). We’re building a movement of leaders who understand that the most effective method for creating growth and enduring profitability is to have an inspired and fulfilled* workforce. You’re already part of the movement and we need your help. October 30-November 1, 2012 (make a note in your calendar now) you’ll be able to download a free copy of Stomp the Elephant in the Office (it’s just our way of saying thanks for being you). Our goal is to get the ebook into the hands of 50,000 leaders worldwide. Since you already believe in this mission, you’re the best person to ask to help spread the word if you feel Stomp is useful or helpful to someone else. If you’re willing to share these essential tools with others, we’d like to ask you to share the free eBook with others as well. 1. Download the book here (http://www.amazon.com/dp/B009SEX5JM) Oct 30-Nov 1. 2. Please consider 10 others you’d like to share the free offer with. Blog, Tweet, Like, Post and share more about the special offer for Stomp the Elephant in the Office with people whose lives will be transformed by the tools in the book. 4. Visit our website for more free resources (including our “Elephant Stomping” Group Guide). Thank you for the important role you play as a leader, supporter and mentor to our organization. * Our definition of fulfilled includes an understanding that everyone is capable of doing something significant to contribute to high performance. When the individual does that, they know their potential is being realized.